Hi there blog friends! If you live in the daylight saving time zone....did you turn your clocks back???? The dark of winter is now upon those of us who do. All the more reason to have a hobby like paper crafting to lift us out of our winter doldrums, right? "Winter Birthday" - This month is my birthday month (yay me!) so I'd like to see winter-themed birthday projects. Think ice-skating, skiing, snow, snowflakes, fireplace, or something that represents winter to you but be sure to make it birthday-themed. Have fun and keep it CAS! 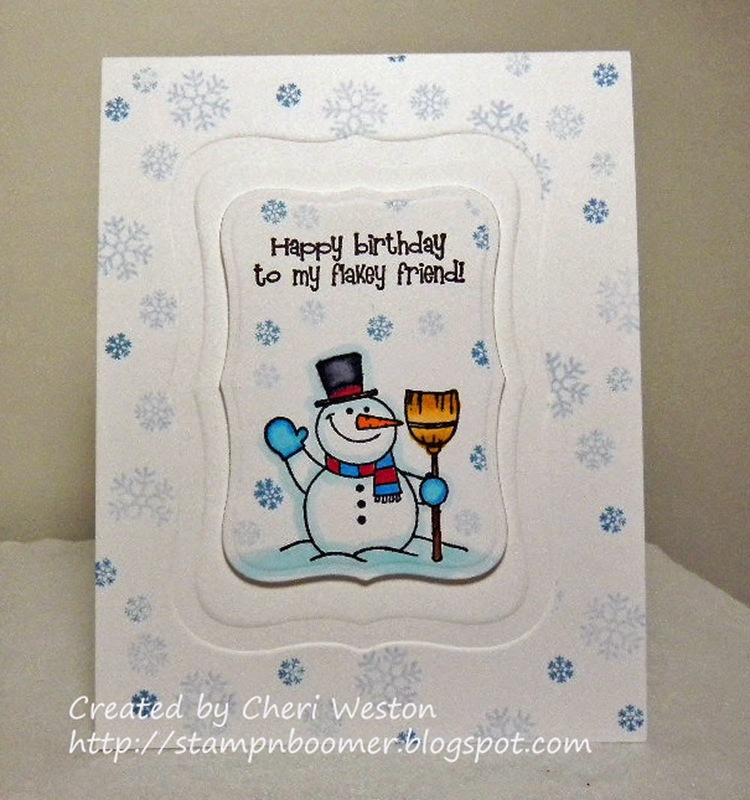 I reacquainted myself with an old "friend" in this GKD stamp set called "Snow Much Fun". (I think it's been retired and is no longer available). I first de-bossed my base card with Spellbinders Labels Eighteen and then after stamping the image on another piece of cs I cut it out using the next size and used pop dots to pop it out of the "window". Thanks for stopping by! I hope you have a great week and I hope you'll find some time to join the CAS challenge at Outlawz Challenges. I'm entering this card in the Anything Goes challenge at TTCRD. Super cute Cheri! Love the debossed frame. And being a lover of all things snowmen, that is one sweet image!!! I'll have to check my stash, I think I have that set! Lucky me!! Cheri- this is such an adorable card! Loving your cute snowman especially as it is hot and dry here. Nice coooool change lol. So cute and pretty. Thank you so much for sharing your lovely creations with us at Through the Craft Room Door.